View Event here on MI ND. 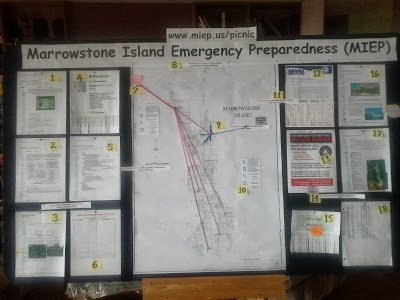 Come to the All-County Picnic and visit our Marrowstone Island Emergency Preparedness (MIEP) booth to learn (see display board and table below) what our MIEP Team is doing to help Islanders prepare for a disaster as described in this Worst case scenario. This board will be on display in our MIEP booth on Sunday. Match the numbers on photo with list below and click on the links for more information! "Communication is key – before, during and after an emergency/disaster"
"Communicate with nearby neighbors AND your Section Coordinators.via walkie talkies"
"YOYO" - "You're On Your Own"
Click bit.ly/hard-hat to see some links that were not included on this display board. “In the first hours and days after an emergency, first responders (police, fire, paramedics, etc.) will be busy with hundreds of calls, so people need to get to know what YOYO means – “You’re on Your Own” – says Bob Hamlin, manager of the county’s DEM.